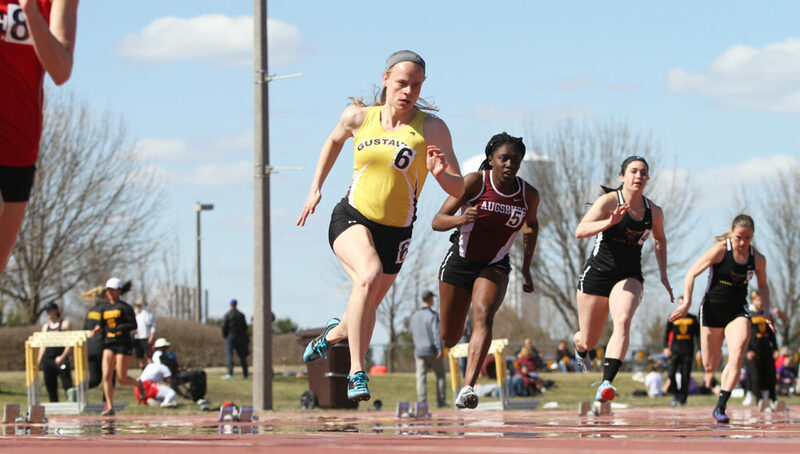 ST. PETER, Minn. – The Gustavus women’s track & field shined at the 18th Annual Drake Alternative meet on Saturday as the team turned in six individual top finishes and many other notable performances. Sprinter McKayla Stowell (Jr., Le Sueur, Minn.) led the Black and Gold with two first place finishes. Stowell crossed the finish line first in both the 100-meter and 200-meter dashes. She was clocked at 12.39 in the 100, and 26.06 in the 200 for a personal best. Five other Gusties claimed first place times: Lily Anderson (So., Waterville, Minn.), Abbie Schnabel (Jr., Hamburg, Minn.), Sadie Klug (Sr., Waseca, Minn.), Olivia Rosenow (Sr., Maple Grove, Minn.), and Marisa Morgan (Sr., Rockford, Ill.). Anderson finished first in the 400-meter run with a career best time of 1:00.83. Megan Hill (So., Denver, Colo.) finished right behind her at 1:01.37 for second. Two Gusties also finished first-second in the 800-meter run, Schnabel first at 2:18.31 and Haley Anderson (So., Eden Prairie, Minn.) second at 2:22.18 – a personal best. Distance runners and fellow seniors Klug and Rosenow each claimed top finishes. Klug in the 5,000-meter run at 18:03.91 and Rosenow in the 3,000-meter steeplechase at 11:24.48 – a 26-second personal record. Morgan led the Gustie throwers with a first place and personal best javelin throw of 126-5. Katie Keelin (So., Burnsville, Minn.) also placed third in the hammer throw, finishing behind Division II participants at 153-6. In addition, the 4×100-meter relay squad of DeAnna Giles (Fy., Plymouth, Minn.), Lily Anderson, Erin Teichroew (Fy., Duluth, Minn.), and Stowell finished first at 50.06. Lily Anderson, Tierney Winter (So., Waterville, Minn.), Hill, and Schnabel were also runners-up in the 4×400 at 4:09.98. Another pair of runner-up finishes came from Alex Anderson (So., Sioux Falls, S.D.) and Mallory Butchko (Jr., Elko, Minn.). Anderson was second in the high jump with her second-best career outdoor leap of 5-1. Butchko was second in the pole vault at 10-4. Gustavus next prepares for the Minnesota Intercollegiate Athletic Conference Multis next Thursday-Friday in Northfield, Minn., along with the Minnesota State Twilight meet next Friday in Mankato, Minn.